Chhattisgarh is industrialising fast: within 10 years of its creation, the state has 200 large industrial units and scores of small ones. More than 700 are on their way. A handful of units existed when this largely agricultural state was carved out of Madhya Pradesh in 2000. Known as central India's rice bowl, Chhattisgarh is speeding towards industrialisation. The state has 10,300 MW of coalbased power capacity, including the captive 2,063 MW that industry consumes. This is about 12 per cent of India's current coal-based power capacity. To this, it will add 56,000 MW, which is 65 per cent of the country's coal-based installed capacity, as per the Central Electricity Authority. Nearly two-thirds of this capacity are planned in Raigarh (37 per cent) and Janjgir- Champa (34 per cent). The state's sponge iron capacity of eight million tonnes per annum (mtpa) is 27 per cent of India's and is second only to Orissa. 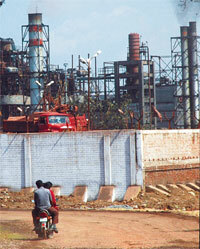 But Chhattisgarh will soon surpass its neighbour as it has big plans for sponge iron. Chhattisgarh's planned capacity will equal India's current total capacity. Chhattisgarh also has 13.8 mtpa cement capacity, contributing six per cent to the country's. The state's sights are set on becoming the cement capital of India by adding 100 mtpa to its cement capacity, 51 per cent of the country's present installed capacity. Most of the rural population, including 32 per cent tribals, live on agriculture and non-timber forest produce. As the state rushes to industrialise, it is diverting to industry, land and foressts that sustain this population. Between 1999 and 2007 Chhattisgarh lost 82,300 hectare (ha) of its forests that covered 41.3 per cent of its area, according to the Forest Survey of India . Obtaining a mine lease or setting up a company in Chhattisgarh is easy. On June 2, 2004, Pushp Steel and Mines Limited was formed. The same day, with a capital of Rs 1 lakh, it applied for an iron ore mining lease in Chhattisgarh. The state government recommended to the Centre a prospecting licence for the company, allowing detailed exploration of minerals, and a year later a mining lease in its favour. The state government also signed a memorandum of understanding (MoU) with the company, in June 2005—six months after granting the prospecting licence, to set up a Rs 300- crore sponge iron plant in Durg. The Delhi High Court passed an order on July 20 this year and cancelled the lease. It asked the state to carry out a fresh round of applications. The petition was filed by the rival S K Sarawagi and Company. But the state mining secretary, S K Behar, is undeterred. He said, "Mining should be promoted; it brings in revenue." This when the Union ministry of Mines speaks of two crucial prerequisites for a licence: the company's financial resources and mining experience. The Rs 1 lakh capital of Pushp Steel is a clear bypass; so is the lack of mining experience, it being a new company. This brings to light the carelessness with which the state is treating its resources. The state government has signed 115 MoUs , based on which the companies will submit project proposals. The proposed investment of these MoUs is Rs 1,76,193 crore. Each of the MoUs is in turn a gamut of projects taking the total number to five times—543. Twelve MoUs have moved two stages—companies have submitted project proposals, based on which the Union environment ministry issued them terms of reference (TOR) for the environment impact assessment (EIA). Adding up 76 projects that have been cleared, 138 projects in the process of being cleared and projects for which MoUs have been signed, the sum total comes to a mind-boggling 745. "Industrialisation has grown at a tremendous pace since the state was formed," said Devji Bhai Patel, MLA from Raipur who belongs to the BJP, the ruling party in the state. But the concentration of industrial units started taking place in 2002, the state industries secretary, P Ramesh Kumar, said. Some pockets were designated industrial estates, but not with much effect. "At the time no one could assess the impact of industrial concentration," he added. According to the Reserve Bank of India, Chhattisgarh's revenue in 2008-09 was Rs 16,778 crore. As per the state's Directorate of Geology and Mining, Chhattisgarh earned Rs 1,237 crore as mineral revenue that year which was a minuscule 7.4 per cent of the state's total revenue. Coal contributed the maximum by raking in close to Rs 1,000 crore, followed by limestone (Rs 67 crore) and iron ore (Rs 61 crore). While these are the state earnings from minerals, the value of these minerals produced was close to Rs 10,457 crore for 2008-09. The revenue is a mere 12 per cent of the value of minerals. But the question also is if the revenue, whatever the amount, will justify the enormous volume of resources it will exploit? The annual water requirement for these 745 projects is estimated at 3,000 million cubic metre (mcm); this could meet the domestic water requirement of about 274 million people, 13 times the population of Chhattisgarh. According to the directorate, 75,000 ha is under mining. Official records peg the land requirement for projects cleared and in pipeline at 65,000 ha. Estimated land requirement for the MoUs is an additional 50,000 ha. The coal requirement for the 56,000 MW planned power capacity will be an astounding 311 million tonnes. The devastation of this enormous coal consumption and combustion cannot be envisaged as yet. For example, power generation in the state alone will produce 133 million tonnes of flyash. It will generate more than one million tonne of suspended particulate matter (SPM) annually; three million tonnes each of oxides of sulphur and oxides of nitrogen will also be generated. The government is prepared. Are the people ready? Are they willing?